When it comes to movies and TV, I’ve developed a knee-jerk cringe in reaction to seeing a group of white protagonists with one or two black companions. It’s an automatic response, almost instinctual, because I know that those black people are the expendable ones. I know that the writers who are the gods of that story’s universe will eventually cast off the black characters on a whim, in favor of advancing the plot of their white comrades. It’s something that has bothered me deep down, in ways that have taken me a long time to be able to explain in words rather than emotion. The Walking Dead, despite being praised for its strong character development (one of my favorite things about the show when it first started airing), has also come under a lot of fire for its treatment of black characters. Everyone knows this, the showrunners are aware of the criticism, and it’s not news to most people who are fans of the series. That’s why the show’s spin-off, Fear the Walking Dead, was disappointing when it continued the same trend by killing off three black characters within the first two episodes. Each one of those characters had no real development of their own and became a disposable asset in favor of advancing one of the protagonists, the plot, or both. It dawned on me then why the expendability of black characters in the overall scope of film and television bothered me so much. It’s the reason the Black Lives Matter movement was necessary. 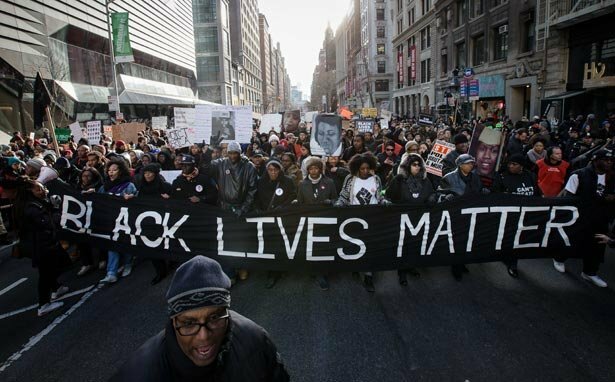 It’s the reason people have marched and protested in various cities against police brutality. It’s the reason nerds and pop culturists have been discussing and demanding more diversity in their entertainment. It’s the reason why, in a world of Freddie Gray’s, Michael Brown’s, Walter Scott’s, and Sandra Bland’s, the expendability of black characters in entertainment becomes a direct reflection of society’s overall notion that black people are simply dispensable. Looking at you, Fear the Walking Dead. Now I know this is most likely the part in the editorial where people will start thinking, “but it’s only a TV show” or “you’re overreacting and reading too much into this” or “stop being so sensitive” or my personal favorite when it comes to lack of accountability, “just get over it.” This is the part where people will accuse me of attempting to spin a post-apocalyptic zombie television series into an issue about race, in their attempt to make the world of The Walking Dead seem like far away fiction that is separate from the tribulations of our everyday lives. All of those excuses couldn’t be any more lame. The Walking Dead as a creative property has always been based on the very real subject of what it means to be human. Fiction has always been a tool that is used to comment on issues of society as it relates to human nature. It’s the reason we tell stories. Let’s not suddenly forget that, because race is uncomfortable to talk about. Our perception of race is heavily influenced by the images we see on a daily basis. Many of those images are funneled through media that we consume as recreation, until those images become a blueprint for the associations we make of people based on their race. If the news were to simply mention that a woman had her money stolen, who have they already trained you to visualize first? Is it the black guy in a hoodie, or is it the white guy in a business suit on Wall Street? Be honest. Imagery goes hand in hand with the disposability of black people, a constant theme in both our entertainment and American society at large for longer than history would like us to remember. The recurrent imagery associated with black expendability vs white heroism often begins with stripping the former of their humanity. When the Michael Brown story broke, and Darren Wilson was facing accusations of murdering an unarmed young black man, one of the first things to spread through the media was camera footage of Brown stealing cigars from a store earlier that day. 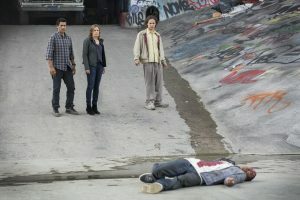 Various news outlets and media began spinning a narrative that painted Brown as an unforgivable thug and a villain while Wilson became the hero. This narrative included imagery of Brown that reinforced the black thug stereotype, thereby winning some audience members over in favor of Wilson’s innocence. Once Michael Brown was reduced to a criminal in the eyes of the viewers, he became expendable. This same storytelling technique of using imagery and a narrative of black criminality to control audience reaction is found throughout a host of books, films, or TV shows. 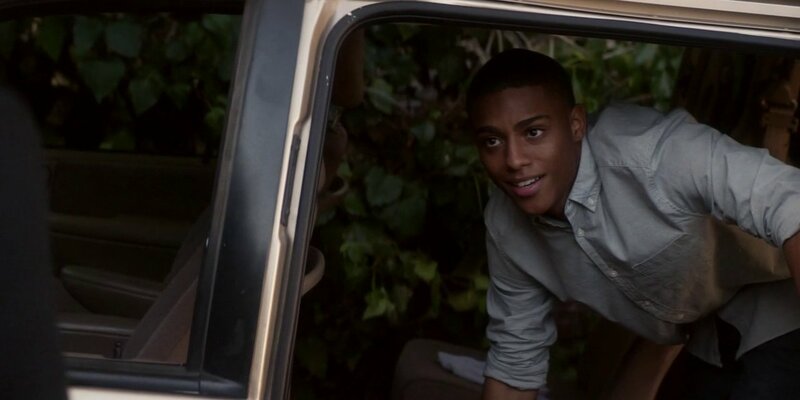 When Calvin is introduced in Fear the Walking Dead, he is clean-cut, shaven, and dressed nicely in comparison to Nick. 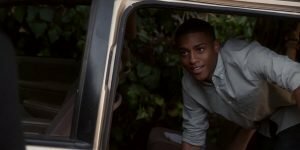 As a friend of Nick and the family, Calvin seems eager to help Madison and Travis when they approach him about Nick’s disappearance. 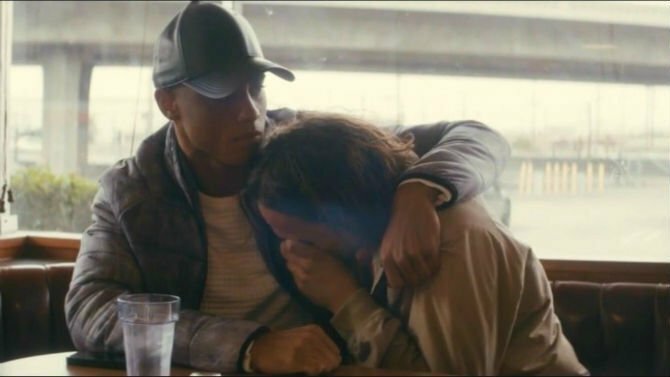 Not too long after, Calvin meets Nick in a diner. One slight but notable change has been made to Calvin’s appearance: he is wearing a black leather baseball cap with a curved brim. In TV and film, this is a slight, but common indicator that the character under the hat is hiding something. Despite what the audience has seen of Calvin only moments before, through that one subtle cue the viewer’s now know that he is not to be trusted. The only thing that changed was his imagery, effectively altering how he was perceived. It is at this precise point that the writers have stripped Calvin of his humanity and any chance of character growth. I cringed when I saw this scene, because I knew what was coming. It was revealed that Calvin is in fact Nick’s drug dealer. Because the only other side of Calvin we ever got to see was the nice guy persona from earlier, this reveal can only make him look like one thing: a lying villain. How could a person that is Nick’s friend pretend to be concerned about him to his family, but continue to sell him drugs on the side? By writing Calvin as a nice guy at first, the writers forced the audience to ask this question when the reveal was made, painting Calvin as the villain and Nick as the hero for the purpose of this scene and the events that would unfold later. Calvin’s character falls flat, not because he is a drug dealer, but because he is never given the same level of complex emotions and motivations that Nick is afforded. This is on purpose. Once this narrative about Calvin is made, it becomes easier for the audience to accept his death at Nick’s hands later on. Once Calvin was reduced to a criminal, he became expendable. This narrative is not unlike the one that was used when the media portrayed Michael Brown as a thug, and Darren Wilson as a loving family man who was only trying to do the right thing. My intent is not to put the obviously tragic story of Michael Brown’s death on the same level as a TV show. Instead, it is to illustrate that whether we are discussing fiction or reality, the same narrative about black people is used over and over, and plays a significant role in shaping our perceptions of race. As that imagery becomes reinforced through entertainment, effectively stripping black people of their humanity, it becomes easy for the audience, whether they’re watching a television show or yet another heartbreaking news broadcast, to subconsciously view the black person as disposable. Black drug dealers do exist. So do white ones. Which one you picture in your mind in that nanosecond after reading the words drug dealer will inform your bias, even on a subconscious level. And that’s what we’re dealing with here, when the executive producer of a popular TV series can have three black characters die in the first two episodes in order to push the narrative of the white characters, and still insist that none of it had to do with race. The most dangerous forms of racial bias are the ones you don’t even know are there. Calvin became disposable once his narrative served the plot and altered our perception of Nick, even momentarily. Matt became disposable once his romantic relationship with Alicia served her emotional development after he became sick. Other than the fact that Matt was an artist, we never learn anything else about him and after he dies he is barely mentioned again. Artie had the least character development of anyone. He was a principal and then a Walker. Plot served. Done. What if the writers had asked the same questions about Calvin as they did about Nick? What led Calvin to become a drug dealer? What was he like with his family? How does it affect them? Did he love them? Did he love himself? How does selling drugs affect him in the wake of this infestation? Did he, like Nick, feel that he was living in the end times his entire life and the rest of the world was just catching up? Erickson’s statement of something not “feeling true to the character or relationship” is a poor excuse, because if those questions are true for Nick, they’re true for Calvin. Unless, of course, the character was disposable to begin with. I get it. What I’m saying is far-fetched for some people because most don’t believe they have those biases, not on purpose. 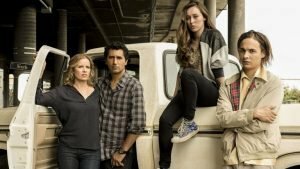 If Dave Erickson were to read this, he’d likely point out the diversity of characters within the show as proof that the creators are listening. We wanted more diversity, and that’s what they did. The problem, however, is that the writers changed the level of diversity, but they didn’t change the narrative. Black people are told they don’t matter every waking day of their lives. It’s in our movies and television, it’s in our advertisements, it’s in our laws and policies, it‘s in the way the producers and writers treat us on a show that questions how far our humanity is able to go. Maybe it’s time for them to turn that mirror inward. Recognize that if you’re writing in such a way that the audience is able to see something about themselves, something about their humanity, in your characters, then you’re taking on an enormous responsibility to find that humanity in everyone. When you look at it like that, no one is simply disposable. Takeia Marie is a freelance illustrator and lover of all things comics, food, and Hip-Hop. She has done conceptual work for advertisements produced for Country Crock, Fiber One, ESPN, and more. When she’s not drawing she loves writing and has contributed pieces to the Hip Hop Speakeasy and now, Black-SciFi.com. She’s always hungry and is ultimately looking for her next sandwich. She can be found on Twitter, Instagram, and her personal website.